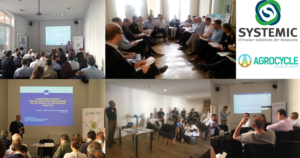 On the 30th May 2018 the H2020 projects SYSTEMIC and AGROCYCLE held a joint policy-research workshop entitled ‘Fertilising products based on animal manure under the Nitrates Directive and the Circular Economy’ in Brussels. The uptake of nutrient recovery from bio-waste, animal manure and sewage sludge across Europe is only viable if there is an effective market for the final products. A major barrier to the advancement of a viable market for nutrients recovered from manure are the limitations of the Nitrates Directive. Without derogation, 170 kg of nitrogen from livestock manure per ha per year can be applied, including any processed manure and nutrients recovered from manure. The European Commission has recognised that the new products coming from nutrient recovery plants may have the potential to be as agronomically effective and have the same environmental performance as chemical fertilisers and therefore could, potentially, be given end of animal manure status and therefore exempted from the 170 kg N per ha per year limitation of the Nitrates Directive. In order to propose this update of the implementation of the Nitrates Directive, EC DG Environment have mandated EC JRC with a two year study to look into the product quality, agronomic efficiency and environmental performance of fertilising products derived from manure. The goal of this workshop was to feed into the EC DG Environment and EC JRC process by discussing the characteristics (product quality, agronomic efficiency and environmental performance) of different groups of fertiliser produced from manure. 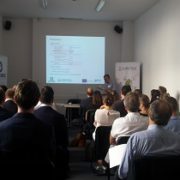 By doing so, SYSTEMIC and AGROCYCLE aimed to identify what further information was needed by the EC JRC for the study, and help policy makers to evaluate the consequences of certain decisions and legislation for the uptake of nutrient recovered products in the market to stimulate the implementation of the Circular Economy. Over 50 experts, including representatives of the European Commission (DG ENV, RTD and EASME), Member State representatives (including members of the Nitrates Committee), academic researchers, and key stakeholder groups, attended the workshop. The focus of the discussion was on four product groups: ammonium sulphates, ammonium nitrates, mineral concentrates and struvite. Product information sheets on each of the four groups prepared by SYSTEMIC prior to the workshop can be found below. 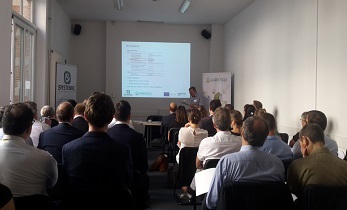 The workshop was introduced by the Coordinator of SYSTEMIC, Oscar Schoumans before Wim Debeuckelaere EC DG Environment presented an overview of the ongoing study, the timings and key moments during the study and their priorities, and information needed. This was followed with split parallel sessions in which participants had the opportunity to discuss product quality, agronomic and environmental aspects of each of the four product groups before joining back together for a final discussion.